715 pages | 286 B/W Illus. High performance liquid chromatography (HPLC) is one of the most widespread analytical and preparative scale separation techniques used for both scientific investigations and industrial and biomedical analysis. 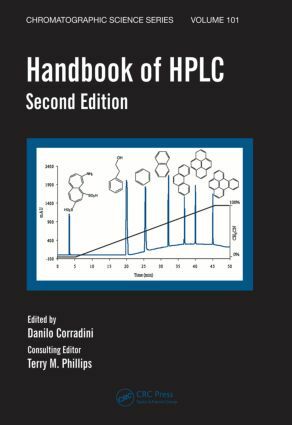 Now in its second edition, this revised and updated version of the Handbook of HPLC examines the new advances made in this field since the publication of the benchmark first edition twelve years ago. It reports detailed information on fundamental and practical aspects of HPLC related to conventional format and sophisticated novel approaches which have been developed to address a variety of separation problems in different fields. New concepts presented in this edition include monolithic columns, bonded stationary phases, micro-HPLC, two-dimensional comprehensive liquid chromatography, gradient elution mode, and capillary electromigration techniques. The book also discusses LC-MS interfaces, nonlinear chromatography, displacement chromatography of peptides and proteins, field-flow fractionation, retention models for ions, and polymer HPLC. The first section of the book explores emerging novel aspects of HPLC and related separation methods based on the differential velocity of analytes in a liquid medium under the action of either an electric field (capillary electromigration techniques) or a gravitational field (field-flow fractionation). The section focusing on applications highlights four significant areas in which HPLC is successfully employed: chiral pharmaceutical, environmental analysis, food analysis, and forensic science. Explanatory figures and tables supplement the text and clarify difficult concepts. Extensive references provide gateways to more focused study. Suitable for undergraduates or new practitioners interested in improving their knowledge on the current status and future trends of HPLC, the book is also a critical resource for researchers looking for solutions to complex separation problems or those who currently use HPLC either as an analytical or a preparative scale tool. Danilo Corradini is research director at the Institute of Chemical Methodologies of the Italian National Research Council (CNR) and a member of the General Scientific Advisory Board of CNR. His involvement in separation science started in 1976 with his research work on chromatography and electrophoresis for his PhD studies in chemistry, which was carried out at Sapienza University of Rome, Italy, under the direction of Michael Lederer, founder and first editor of the Journal of Chromatography. In 1983–1984, he worked with Csaba Horváth, the pioneer of HPLC, at the Department of Chemical Engineering at Yale University, New Haven (USA), where he initiated his first investigations on the HPLC of proteins and peptides. He continued this at the Institute of Chromatography of CNR after he returned to Italy. Currently, he is the head of the chromatography and capillary electrophoresis research unit of the Institute of Chemical Methodologies in Montelibretti, Rome. His research interests are focused on the theoretical and practical aspects of HPLC and capillary electromigration techniques for analytical scale separations of biopolymers, low molecular mass metabolites, and phytochemicals. He has extensively published in international scientific journals, has been chairman and invited speaker in national and international congresses and meetings, and serves on the editorial boards of several journals. He is the chairman of the Interdivisional Group of Separation Science of the Italian Chemical Society and a member of the International Advisory Board of the Mediterranean Separation Science Foundation Research and Training Center in Messina, Italy. In 2009 the Hungarian Separation Science Society assigned him the Csaba Horváth Memorial Award in recognition of his significant contribution to the development, understanding, and propagation of capillary electrophoresis throughout the world and his involvement in the development of separation science in Hungary.